Page 317: The statement about AMT's lodgings is incorrect. His address was 78 High Street, Hampton; but I quite unjustifiably and incorrectly assumed that this was the High Street passing through Hampton Hill which borders the NPL site. In fact it was the High Street of old Hampton village, further away to the south-west. The lodging-house, Ivy House, was quite a superior establishment. (Photograph taken in 1990.) Streetmap here. A plaque marking AMT's period of residence there was unveiled on 2 December 2001. Page 345: One of my omissions in research was that I neglected to make contact with the secretary of the Walton Athletic Club, Mr J. F. 'Peter' Harding. Fortunately, in 1999 Mr Pat Butcher contacted Mr Harding and published two articles including anecdotes from Mr Harding, one in the (London) Financial Times, 15 May 1999, and one in Runners World, September 1999. They had the theme of AMT as a 'World Class Distance Runner'. 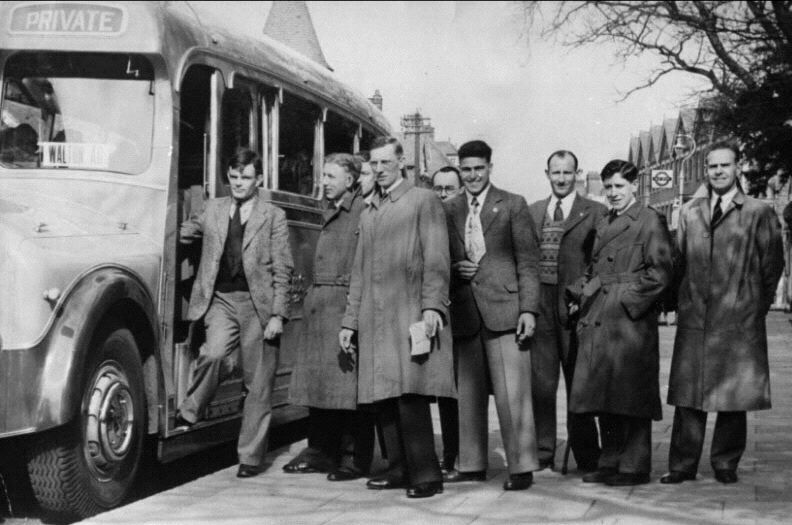 This photograph shows Alan Turing (on the bus steps) with other members of the Walton Athletic Club, an amateur club based in Walton, Surrey, an outer suburb of south-west London, not far from the National Physical Laboratory. The club members were probably on their way to a race meeting on a Saturday in 1946. 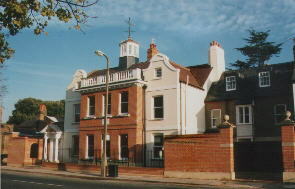 The location is identifiable as Hersham Road, Walton. The figure at the front of the group, holding a piece of paper, is Ted Shepherd, a cross-country runner who was probably organising the transport for the meeting. Second from the right is his son Brian Shepherd, who would accompany Alan Turing to race meetings and pass him food at stages during long distance runs. This information comes from Mr Mike Saunders, who is Ted Shepherd's grandson, and recalls his grandfather speaking of Turing's high-carb training diet. 'He was very popular with the boys, but he wasn't one of them. He was a strange character, a very reserved sort, but he mixed in with everybody quite well; he was even a member of our committee. We had no idea what he did. We didn't even know where he worked until he asked us if Walton would have a match with NPL. Alan Turing achieved world-class Marathon standards. His best time of 2 hours, 46 minutes, 3 seconds, was only 11 minutes slower than the winner in the 1948 Olympic Games. In a 1948 cross-country race he finished ahead of Tom Richards who was to win the silver medal in the Olympics. Page 370: Joan Murray (neé Clarke) thought it was possible that she did once spot AMT in the course of her work, at some point after these 1947 encounters. (She remained a full-time officer at GCHQ.) However, even if their paths did cross in this way, there was no actual meeting or talk. The only other contact was the letter AMT sent her in 1952 (page 465), which was also the year in which she married. There is further material in the Alan Turing Internet Scrapbook: Alan Turing's Electronic Brain.